Toro Rosso confirmed today that son of two-time World Rally Championship winner Carlos Sainz, Carlos Sainz, Jr., will be taking Jean-Eric Vergne's place at Scuderia Toro Rosso next year. Sainz, Jr., even beat out GP3 champion Alex Lynn for the seat. Carlos the Younger has won both the Formula Renault 2.0 and 3.5 titles and apparently left a good impression on the Red Bull crew in testing at both Silverstone last year as well as at Abu Dhabi this year. 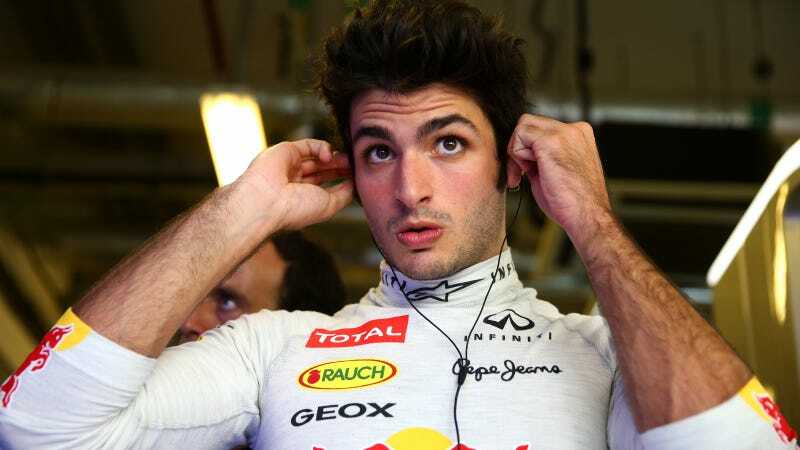 Sainz, Jr., has veen considered Vergne's likely replacement for a while, but Toro Rosso finally confirmed it this week. I am really happy to have landed the drive with Scuderia Toro Rosso. Ever since I have been part of Red Bull's Young Driver Programme, this has been my aim and I want to thank Red Bull for putting their faith in me. I have had a very successful season in World Series by Renault this year and now I am looking forward to taking the step up to Formula 1. I tested for a day with Toro Rosso last year and I liked the atmosphere in the team. In the next few months I will be working hard on my preparation, ready to get in the cockpit in Jerez for the first test of next year. It will be nice to make my "official" debut as a Formula 1 driver in my home country! He joins fellow rookie and youngest Formula One driver ever Max Verstappen at Red Bull's junior team, making Toro Rosso the really, really, really junior team, I suppose. This leaves McLaren as the sole team left to confirm its driver line-up. Everyone knows Alonso is on the way, but all bets are off as to who Alonso's teammate will be. Many fans would prefer that driver to be Jenson Button, who scored over twice the points of his younger teammate Kevin Magnussen, but McLaren is rumored to want to continue developing Magnussen's talent.